* This item will take 3-4 days to ship. It will be shipped directly from the manufacturer. Shipping only available in Continental United States. You can earn 300 yards with this purchase! The Tour Edge Bazooka 260 club set includes an oversized high-MOI 460cc titanium matrix driver that promotes greater forgiveness and longer, more consistent shots as well as an oversized 3-wood that is designed with a low CG to easily get the ball in the air. The forgiving #4 hybrid has a deep CG for maximum carry and soft landing while the oversized irons have an undercut cavity for more forgiveness and a larger sweet spot for higher, accurate shots. The set also includes a high MOI heel-toe weighted putter with an easy to use alignment aid for more accuracy and a dual strap stand bag with six-way divider top, dual carry strap, and four zippered pockets. 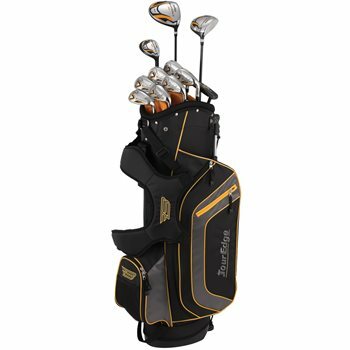 Set includes: Driver, 3W, 4H, 5-PW, SW, putter, lightweight dual strap stand bag with fast action stand. Headcovers are included with the woods, hybrid, and putter. Lifetime warranty.